On Thursday, December 21, the 8th grade girls played Roland Story. This was the 8th grade girls’ final game of the season. In the first quarter, Nevada was slow to adjust to Roland Story’s press. In the second quarter, Nevada adjusted to their press and cut into their lead to 14-18. In the second half, the game hovered around a 12 point lead then Roland Story stretched it at the very end and Nevada couldn’t keep up. The Cubs lost 30-48. The Roland Story girls were undefeated, and Coach Thompson was pleased that they were able to cut into their gap from the first time Nevada played them. “Our girls can contain to narrow that gap on teams like Roland Story if they put in some off season work with Coach Neubauer,” said Coach Thompson. Nevada’s leading scores are Alex Arnaud and Maddie Dunham with 8 points. Mayzi Weig had 6 points, Elie Tuhn had 4 points, and Hannah Waldera and Briar Crain each had 2 points. The Cubs dominated the B-game 28-2. The girls were very unselfish moving the ball on offense. 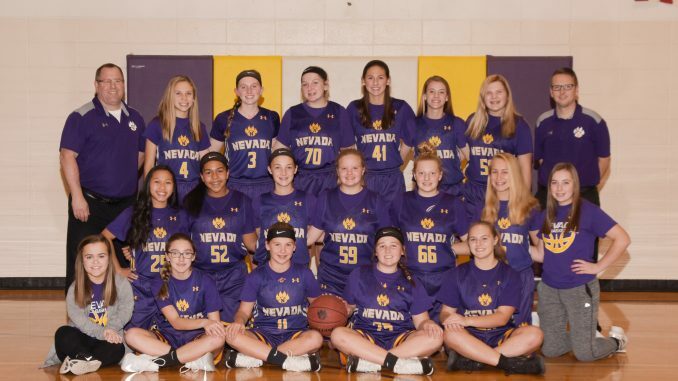 The leading scorers were Makayla Spaid with 11 points, Savannah Skaggs with 10 points, and Sammie Harridge and Tessa Borwick had three points. Katelyn Khounsourath had one point. The A-team’s record on the season was 7-4, while the B-team’s season record was 10-1. Article contributed by Mason Adams.